I love the simple life. I bet you do, too. But here’s the thing—no matter what you or I do, our “simple lives” aren’t ever going to be the simple lives of 100ish years ago. Want to take a guess at why? Okay, I’ll tell you. It’s because I have two bathrooms in my house. Have you ever stopped to think about how crazy it is that you can have two bathrooms in a house? In the grand scheme of things, it hasn’t been that long since people were treking out to the outhouse. Want to know a few other crazy things that are different from 100ish years ago? My two kids have their own rooms with their own beds. 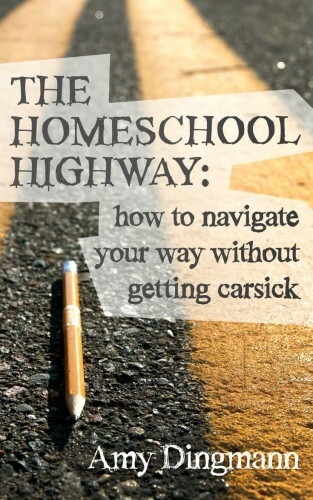 I have a heated vehicle that I can drive ten miles to town when my sons have confirmation class. I can dry clothes in a dryer if I don’t have time to line dry them. Just think about all that for a second. Think about all those things we have, but completely take for granted. Things like power tools, cars, chest freezers, coffee pots that run all day, and ovens that heat to exactly 350 degrees. I mean, forget about things like the Minute Clinic and drive-thru coffee shops—we’re a luxurious world ahead of our Genuine Simple Living Relatives of Ages Past just by having internet to read this post. What we call the simple life now? It’s way different than Laura Ingalls had. Each of the little things that are part of our normal—the things so ingrained and common to us that we don’t even think about them—changes us. Let’s be honest: we’re living in a world that is so far removed from what was behind the simple ways of days past. Our simple life is different because we want to do it. We don’t have to do it. And that, my friends, is a huge difference. Our simple life is safe. We pick and choose our simple. It’s fun to see what we can do and how long we could do it for. But if we get too busy to bake bread or get too attached to that chicken we were supposed to butcher, we can just head to the local grocery store for some store-bought whatever and not tell anyone about it. I know. You might be thinking Okay, Amy. Why are you even bringing this up? Friends, the simple life is not all or nothing. I bring it up because somewhere there is someone feeling the itch to move towards a more simple life, but she doesn’t feel like it’s worth it. 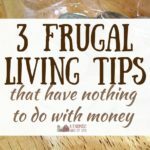 She knows can’t do everything she thinks she has to do to fit into the almighty category of Simple Lifer or Homesteader or Crunchy or Minimalist or whatever the kids are calling it these days. So she’s just not even going to try. It’s because there are keyboard warriors out there that are quick to judge and tell anyone who will bite what the precise definition is of someone living the simple life. And how it’s not you because basically, you’re not them. It’s because I want us to be real about homesteading. I want us to be real about the fact that this isn’t 100 and some years ago and some things are just different. Stop feeling guilty that you can’t do everything. Stop it. Seriously, no guilt. It’s not a contest. Do what you can…and be okay with whatever that is. You might have time to grow tomatoes on your front step…but not have time to bake 15 loaves of bread a week. It’s okay. You might have the space to raise 4 chickens…not 40. It’s okay. You might have kids who can make a mean homemade chicken noodle soup…but also are experts at video games. It’s okay. You might study the simple life and homesteading…by watching YouTube videos. It’s okay. You might cut your own wood and know how to sew your own clothes. And you also might still enjoy, from time to time, a really good cup of coffee at Starbucks. It’s okay. There is a balance to find between modern and old-fashioned, simple and…not. This does not have to be all or nothing. In your quest to break the chains of slavery to technology and “modern life”, please make sure you’re not becoming a slave to simple instead. I actually do "have" to put my clothes on the line year round. My electric bill will be horribly high, and we can't be a "slave" to bills for utilities. As for the rest, I choose it. Home grown anything contains no chemicals. It's more work, but a healthier life. As for more electronics, such as tablets, kindles, ipods, etc…those are luxury items, and I can live without them. Kids however, will have another story. It's true that we are different. I have changed a lot over the past two years and love it. Truth be told, I couldn't and wouldn't want to live totally the way they did. And I am sure they wouldn't of minded some of our conveniences. Thank you… I always feel guilty when I opt to take the "easy route" instead of the "simple route". Sometimes though, with a full time job, it's just to hard to be simple. Fantastically put. It's easy to go overboard with any concept and the concept of simple is what we make it. Just about any steps we take to simplify our life will improve it, no matter how small, it's still better than the alternative crazed out co-dependent life we are trying to opt out of. Interesting and well written! I don't think most people want to actually go completely back more than 100 years, but just wish to get closer to our food sources and the earth from which we gather our sustenance. May I never say as I heard one say, "You should buy your meat from the store in packages so animals don't have to be hurt or killed!" ummmmm…. 100 years ago it was all about food, shelter and clothing and any left over time was spent at church or visiting with family. No extracurricular activities, much, it was all about living and what it took to stay alive. The wood stove takes a lot of work, cooking from scratch takes a lot of work, quilting takes a lot of work but I love my life and the work comes with the territory. I so agree with you. I am a believer of balance. I used to get so disappointed in myself for not getting EVERYTHING done until I said enough is enough. I noticed I was exhausted all the time and I was teaching my kids (through my behavior) that nothing is ever enough. I didn’t want them to learn this from me. Now, I still try to do as much as I can, but I don’t fuss. If I know that a busy week is coming, I buy bread at the store. I get us pizza one night a week for $8. The kids love it, and I get a break from cooking dinner. Is it healthy? For your body, no. For your soul, heck yeah! Thank you. I am guilty of feeling guilty, and this is a good reminder that it’s okay to not do everything the (sometimes not so) simple way. ..simpler doesn’t mean simple….diy, that means it’s probably MORE work for yourself…I don’t preach to my “town friends” about how I do things or that they shouldn’t do this or that….well, ‘occasionally’ I may suggest things…. Cabin Coffee has a drive thru…I finally earned my FREE coffee…..I like hanging clothes out, but the dryer is convenient. And growing vegetables in the garden, delicious!! ..Farmers Market, no weeding evolved….love what I do…and yup, there’s a town job to pay for it…. Ah!!! I LOVE this post and you for saying it! ? Letting go of all the guilt and just enjoying our own version of “simple”. Thank you! I completely loved reading this!! I’m always feeling like whatever I am doing is not enough and that I have to go all or nothing into a simpler/homesteading lifestyle and you just proved I don’t! I love gardening, canning and picking blueberries out of the garden with my boys and I should appreciate more what we have instead of wishing it were different. Thanks! ❤️? Absolutely love this post and can relate to all the comments! I will save and read this every time I start to think….I can do it all or feeling guilty that I haven’t done all that I think I should to live the “simple” life. I couldn’t agree more. I just put a post up on my blog this afternoon about this very thing. I’ve loved everything I’ve read from you so far. Thank you for your inspirations! I love everything about this post. Your writing style and good humor makes it all the more enjoyable! I love being as independent in creating my own foods as is possible. I agree with you too many folks make it into a competition. The ” I milk my goats while I home school my 9 kids, while I sew with my feet” crowd sure do need to take a breath and smell the milk fat. I love that we can choose. More than that, I love you reminding us! Right as usual Amy! I love the thought “is not all or nothing”. 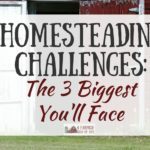 As I plan my move to my homestead, I think I am planning small and manageable steps that are right for me. I do get a lot of pressure from others….oh, you have to have cows. And pigs. And this and that. I know I can’t have all of that. and that’s okay with me… until people start telling me what to do. I love when the experienced folks, like you, give validation that it’s okay to do it my way..and to do it in small bits. Wonderful article. I agree that it is all about balance. It’s great to do things the simple way, but there is nothing wrong with taking a more modern, technology-based approach to things either. I enjoy baking bread myself, but yes, there are some days where I can’t be bothered with it, or just really want that store bought loaf. Do what you want how you want to and that’s all that matters. 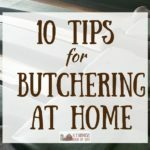 Forget all those people that tell you it had to be done a certain way or you aren’t a true homesteader. Aye, this is cool . Balance is good. Don’t much of the guilt thing too busy being happy, but I suppose resentment creeps in when there is no balance with partners.